Cotton mouth is not one of the most common afflictions of goldfish, but is one of the more serious ones and one that often gets wrongly diagnosed. It can lead to a wide variety of health problems in the goldfish, and should be dealt with as soon as it is spotted, as it is very contagious and can soon go on to affect all of the goldfish within your tank. If you want to ensure that you will be able to diagnose and treat cotton mouth if your spot it, read on to learn more. Cotton mouth is correctly called “Columnaris bacterial,” and as the name suggests, it is a bacterial infection. However, due to the unique appearance of cotton mouth, it is often wrongly diagnosed as a fungus, leading to ineffective treatment. Cotton mouth leads to the growth of what appears to look like a ball of cotton wool around the mouth of the fish, hence the name. It also manifests various other symptoms as well. 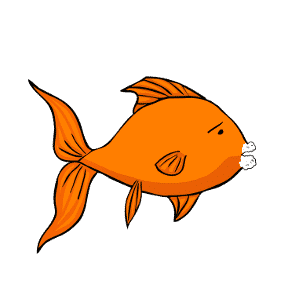 The most distinctive indication of cotton mouth in goldfish is the appearance of what looks like a plug of cotton wool in or around the mouth of the fish, but this may not be one of the first symptoms you can spot. Like all bacterial infections, cotton mouth is usually introduced into a tank with the addition of new fish or water from an infected tank. In order to prevent this, do not share ornaments and equipment between different tanks without disinfecting them first, and ensure that any new fish that you buy are quarantined to check for symptoms for 14-30 days before introducing them into your community tank. Ensuring that the water within your tank is of the optimum quality and that the tank is kept clean can also help to keep the bacteria from spreading and growing. How can cotton mouth be treated? Cotton mouth can be fatal to goldfish, both as the growth obstructs their ability to eat and as the bacteria releases toxins into the body of the fish, which can poison it. Prompt treatment as soon as you spot the early warning signs of the condition is vital to ensure that your fish have the best chance of recovery. Ensuring that your tank water is scrupulously clean and changed regularly will help to keep the bacteria from gaining a foothold within the tank, and is vitally important when you are treating the condition too. Tank medications that can be bought to deal with cotton mouth include medicated foods, such as those that contain potassium permanganate to kill the bacteria. In severe cases or if the fish are no longer able to eat, antibacterial medication added to the tank or sometimes, administered directly to the fish will be required to eradicate the bacteria. Your fish stand the best chance of recovery if treatment is commenced as soon as you spot a problem, and a full recovery from cotton mouth can take several weeks to achieve.